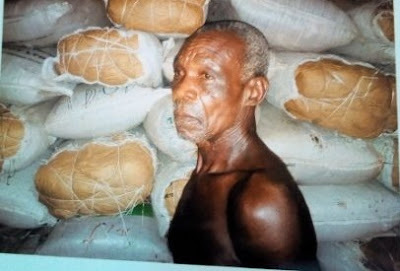 A 64-year-old grandfather, Daniel Idemudia, has been arrested in Benin, by the Edo State Command of the National Drug Law Enforcement Agency (NDLEA), in connection with the discovery of substance suspected to be Indian hemp (cannabis sativa) in a warehouse. The State Command of the NDLEA has launched an onslaught against drug cartels in the State, leading to the discovery of two secret warehouses for weeds suspected to be cannabis sativa. A total of 5,650 kgs of dried weeds suspected to be the banned substance were found in the two warehouses. The first warehouse is a residential house located behind Tipper Garage, Egor, Egor Local Government Area, where 280 sacks of the dried weeds weighing 4,200 kgs. were found. 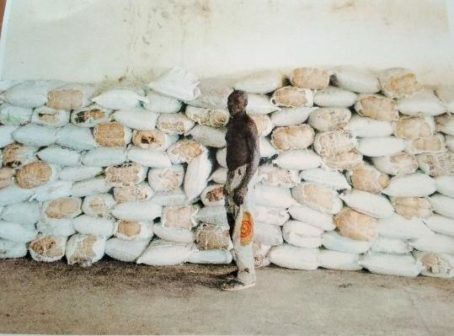 The second warehouse is located at Ugwella-Gidi village, Ovia South West Local Government Area, where 245 sacks of dried weeds weighing 1,450 kgs. were recovered. This major discovery is coming barely few weeks after the Command publicly destroyed 136,844 kgs of various narcotic drugs, including cannabis sativa. The State Commander of NDLEA, Mr. Buba Wakawa, disclosed that the seizures were made based on intelligence reports​ received by the Command. The suspect, Pa Daniel Idemudia, who admitted knowledge of the exhibits found inside the ceiling in his house, said that a friend kept the banned substance in his house. “A friend of mine kept the cannabis inside the ceiling of my house. The house was built by my son who resides in Europe. He promised to handsomely reward me after selling the drugs,” he said.